A nest of arachnids is the stuff of nightmares. Even the presence of a single being can send grown adults into a frenzy. From the Brown Recluse to the Tarantula, they have inspired fear and terror in the minds of countless persons. Spiders may be small and fragile, but they pack a potent punch. In fact, some of the most venomous spiders are some of the smallest in the world. But they aren't as horrible as the media, or a few horror stories, have led us to believe. Many cultures across the world have religious sects devoted solely to the spider. In West Africa, the Caribbean, and in the southern states of the US, the legends of Bre'r Anansi still reign supreme. Nowadays, Anansi is a popular feature of children's books, but the story of the shape shifting, trickster originated in the Ashanti tribes of Africa. The Lakota (Sioux) people of Northern America speak of the dream catcher spider, Iktomi, who teaches mankind infinite wisdom and patience. The spider has links to Abrahamic religions as well. In both Jewish and Islamic oral traditions, there are stories that speak of how a lowly spider helped a prominent religious icon by using its web to cover his tracks. In the Islamic tradition, the Prophet and his companion, Abu Bakr, sought shelter in a cave in order to hide from Quraysh soldiers. In Jewish tradition, it was David who was being pursued. In both stories, after the men found safety in a cave, it is said that a spider - under the instruction of God - spun a web at the caves entrance, which eventually fooled the soldiers into thinking that these religious men had followed a different path. Spiders, while not considered holy, are given special mention in both faiths. Although the legendary Spiderman is a hero for all times, the spider isn't always associated with doing good deeds. In Europe, most people view spiders as a bad omen and in nursery rhymes like The Itsy Bitsy Spider and Little Miss Muffet, spiders are depicted terrifying little kids. This frame of mind is believed to be a remnant of the days of the Black Plague, when many people thought that the evil spider, an emblem of the Devil, brought the illness onto the Earth. Shelob, the evil spider from the Lord of the Rings trilogy, is a play on this tradition. 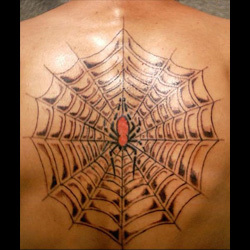 For some, Spider Tattoos (in particular spider webs) are a symbol of physical, emotional, or mental incarceration. They are symbols of being unable to escape entanglement, which accounts for why criminals love spiders and Spider web Tattoos. These insects are poisonous and deadly, and gangs use the image of arachnids as their insignias, often times with racial implications attached. Whether you're intrigued by the clever antics of Anansi or feel bound by life's complicated twists, these tattoos are great ways to show the world that you're much more than a delicate little spider. Artists and tattoo connoisseurs love to add a variety of features to their designs. Some include more cartoonish elements to their artwork, while others play on the fear that a lot of people and make their pieces more sinister. 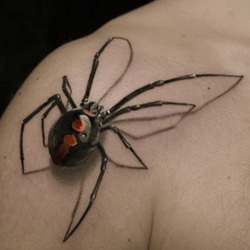 Spider Tattoos tend to be rich hues of black and red, but the color possibilities for designs really rest on the taste of the person getting inked. "Oh, what a tangled web we weave." To be caught in a spider's web isn't as bad as it may seem. A spider's web is seen as a tangle of lies and betrayal, but in ancient Egypt, it was seen as a symbol of fate. The goddess, Neith, was the weaver of destiny and the ancient Egyptian goddess of war and hunting. Lydian mythology speaks of a woman named Arachne who was so adept at weaving, that she beat the goddess Athena during a competition, but this ultimately led to her own demise. Arachne is part of the epic masterpiece The Divine Comedy. Since a spider catches its prey in its web, many contemporary views of a spider's web refer to either being caught doing something evil or setting a trap for others to be caught in. A Spider Web Tattoo on the elbow has become a popular unspoken way for criminals to show to the world that they've done time in prison, but while this isn't the only meaning for this intricate symbol, it is the most well-known association. 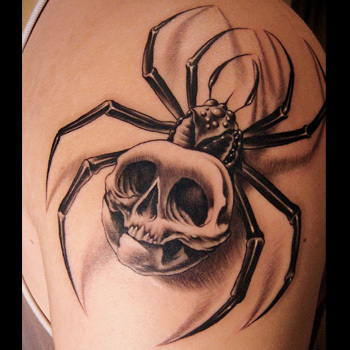 Spider Web Tattoos in general represent an element of mystery, intrigue, and danger. Are you a deadly Black Widow Spider? A delicate Black Widow is not to be trifled with. She may seem fragile and helpless on the outside, but she is poised and ready to launch a deadly strike at a moment's notice. The Black Widow is a symbol of Femininity, Sexual Power, Cunning, Intellect, and Independence. The image is one of the most popular in the genre and is, by far, one most associated with women who have strong, untameable personas. Spiders have inspired awe and wonder in humans throughout history, so it's no surprise that many indigenous peoples across the globe view them as elements of the Divine. From rivers of ancient Egypt to the vast lands of the Americas, spiders were seen as gods of wisdom and cunning. Their association with the spiritual world means that they were, and still are, often depicted using tribal patterns and markings in an effort to impart their magical powers to the natives. 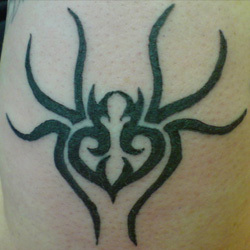 Tribal Spider Tattoos extend this belief by embodying your spiritual intellect and add an air of mystery to an ordinary tattoo. The right design can make or break your artwork. Before sharp needle touches delicate skin, you must first think about what your new tattoo means to you and what message you are trying to send to the world with your body art. Where will it be placed on your body? Will you combine it with other elements? It's a daunting task, figuring out which design works best for your body type and persona, but our team of artists are more than happy to help. Simply visit our design page at www.itattoodesigns.com and take advantage of our Custom Tattoo Service.